Heavy-duty truck lovers everywhere can’t wait to test drive the new 2016 versions of the two most competitive brands in the auto industry—Chevy and Ford. The 2016 Chevy Silverado 2500 HD is getting many new features that will appeal to buyers as well as some new color options. This truck comes with sharp rectangular headlights that integrate seamlessly into the modern grille. What else is new and comparable for the new Chevy Silverado 2500 HD and Ford’s F-250 Super Duty? When it comes to the Chevy Silverado, Chevy offers some great features including a tailgate that remote locks, a 7-inch color touchscreen, wireless charging for your smartphone, and HD radio. These options are also combined with a new steering system that gives you hydraulic assist. These new features are welcomed among heavy-duty truck fans in order to keep up with up-to-date technology and accessible touchscreens. The F-250 Super Duty is unfortunately not seeing too many changes for 2016. Although its little brother the F-150 got totally redesigned for 2015, the Super Duty line of trucks will have to wait a little longer to see any real revisions. The F-250 does come with a rearview camera for 2016 as well as LED lights. This does little in the way of the 2016 Silverado, which has modern interior and exterior styling and accessible features to integrate a modern look into Chevy’s well-loved truck culture. The 2016 Ford F-250 Super Duty offers 440 horsepower as well as 860 lb.-ft. of torque for its beloved fans. This means it can tow up to nearly 14,000 pounds, or, if you’ve got fifth-wheel towing, 16,600 pounds. The Chevy Silverado 2500 HD offers 765 lb.-ft. of torque and a towing capacity of 14,500 pounds. The numbers are pretty close here for Ford, but when you add in all the new options the 2016 Silverado has to offer, the game changes. Both are offered with gas and diesel options to give buyers flexibility when choosing their engines. The modern look for Chevy is combined with flashy grille styling with lights to match and a largely rectangular body that is remnant of many of the stylish vehicles on the road already for 2016. The chrome grille along with a more aerodynamic design for the 2016 Chevy Silverado makes this truck better than ever. 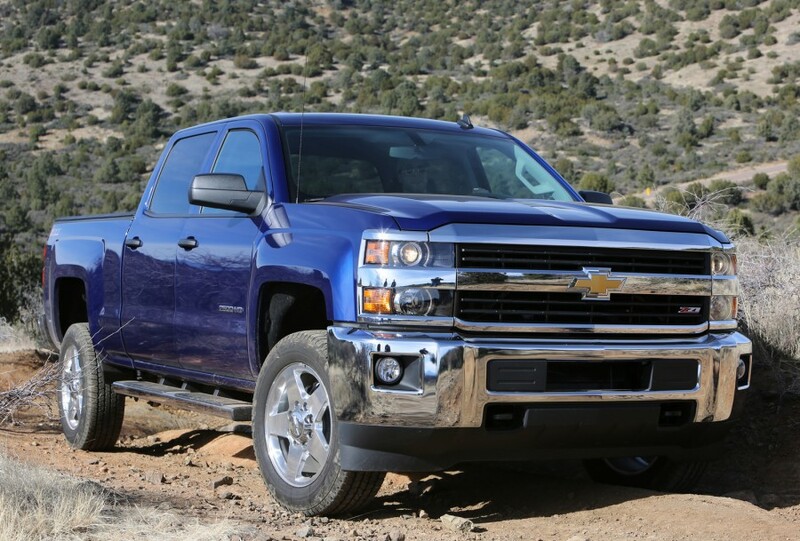 Although the engine hasn’t changed at all for the 2016 Silverado, the features make up for it. The Digital Steering Assist system makes hauling heavy loads even easier. It’s designed to help increase your stability at highway speeds. The fifth wheel towing package should help the Silverado get some more towing capacity, but we’ve yet to hear what those numbers are. The exterior also offers a bed liner that’s spray-in as well as custom packages that involve different trims and designs, such as the Midnight Edition on the LT trim level. Chevy Silverado buyers will also have the option to get the Z71 off-road package, which is compatible with the LT and LTZ trims. This will give you tow hooks in the front, skid plates, and improved shock absorbers. The interior of the 2016 Silverado hasn’t changed too much. Three cab configurations are still available including regular, double, and crew. This also correlates with Ford’s three cab configurations of the regular, super, and crew cabs. Chevy has also helped its drivers to improve storage and loading—the floor is nearly flat load under the second row, so this offers better storage for items that may not be able to fit into the cargo bed. The interior also offers some changes that are specific to technology. The entertainment system, now popularly called “infotainment” MyLink includes Apple CarPlay and Android Auto. Your smartphone is now able to be seamlessly integrated into the technology that comes in the 2016 Silverado 2500 HD. The Chevy’s touchscreen is able to reproduce a version of your smartphone in order to allow your contacts, texts, music, and calls to be accessible while driving. The touchscreen makes functions like this easy and much safer than conventional methods. The Ford F-250 Super Duty still sticks with the SYNC for hands-free calling and voice-activated actions. This also includes MyFord Touch, which features an 8-inch screen and voice controls for things like temperature. The Lariat version also offers a Sony Audio system nine speakers. 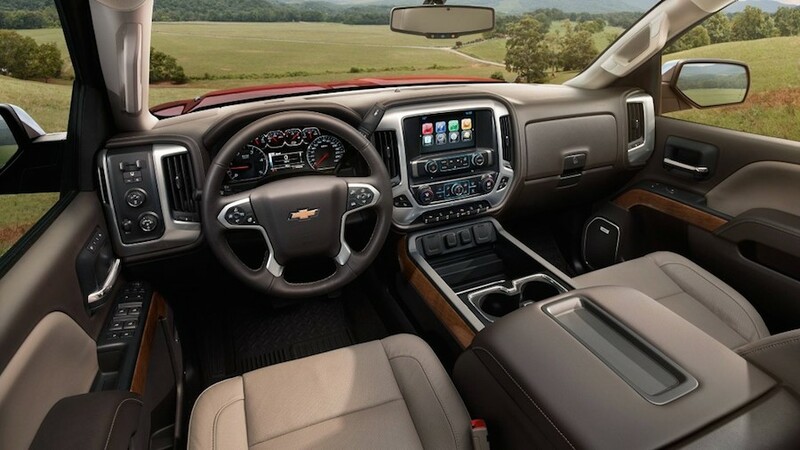 The Chevy Silverado comes with many options and different configurations, including an updated infotainment system as well as improved digital steering for added stability and control. Although it doesn’t have any engine, body, or exterior updates, the Silverado still impresses and has more changes than Ford for the coming 2016 year. With the 2016 Ford Super Duty line, Ford is still offering AdvanceTrac Roll Stability Control, Trailer Sway Control, and Trailer Brake Control. It also comes with a rear camera in addition to a reverse sensing system and exterior backup alarm. All of these features help the driver to maintain better control of the truck, especially when towing a lot of weight at high speeds. The Silverado offers similar protection with stability control, which has the ability to automatically reduce engine power or apply brakes to help maintain control. The security system of the Silverado includes ability to disable the ignition in the even that the correct key is not used to help keep your vehicle safe from theft. These safety features combined with the auto grade braking for trailer towing and sway control help Chevy heavy-duty truck drivers to stay safe on the road and maintain control of their vehicle at all times. The technology for the heavy-duty trucks is not only impressive, but necessary. Keeping the bigger vehicles safe on the road especially when towing is essential for any driver. While there are several heavy-duty trucks out there competing for your consideration, consider the 2016 Chevy Silverado as your next truck when it becomes available. With more new features and a sleeker design compared to Ford’s bulky look, the Chevy Silverado has a lot to offer heavy-duty truck lovers everywhere. When its compared to Ford’s 2016 F-250 Super Duty model, it delivers on the modern look, the better interior, and the more advanced technology that you need for your ride in 2016.